Learn how IBM Watson Health clinical application advisors helped Floyd Health Care System take full advantage of the platform’s many benefits. As part of its journey toward population health management, Floyd wanted to optimize the way it used the IBM® Phytel® solution from IBM Watson Health™ and take advantage of its analytical tools. 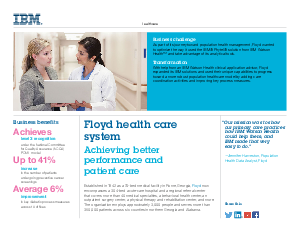 With help from an IBM Watson Health clinical application advisor, Floyd expanded its IBM solutions and used their unique capabilities to progress toward a more robust population healthcare model by adding care coordination activities and improving key process measures.